Smoky Mountain Resorts are great for family vacations! Practically everything is at your fingertips including lots of funtime recreation! Every one is situated in an excellent location! These luxurious stomping grounds have excellent accommodations guaranteed to make your stay in the Smokies a wonderful experience! 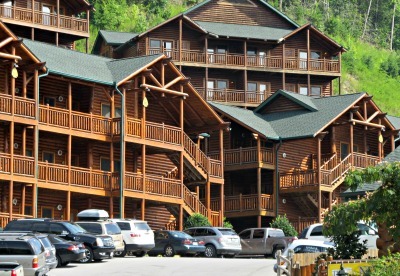 WESTGATE RESORTS - This beautifully secluded Smoky Mountain Resort is conveniently located near Gatlinburg! You'll love everything about Westgate! Of course, you'll enjoy luxuriously furnished rooms, but there's so much more! One of the best things about Westgate is that they are pet friendly! They offer high speed internet, a serenity spa and fitness room, 24-hour front desk, and security, trolley service, two outdoor heated pools, and more! The "coolest" thing about Westgate is Wild Bear Falls! It's their indoor waterpark! You're sure to have a blast here! There are fully equipped kitchens, or kitchenettes in every room! It's the ideal place to spend your family vacation! GOLFVIEW RESORTS - "Breathtakingly beautiful" are the words that come to mind to describe this Smoky Mountain Resort! Golfview, formerly known as Bear Run Falls puts you in the lap of luxury! Choose between a condo, or a log cabin! Whichever way you go, you're going to love the modern decor. How do you want to spend your time in the mountains? Luxurious surroundings, maybe? Or perhaps you prefer the "mountain look." Either way, the furnishings are impressive! Enjoy a nice breakfast before venturing out to nearby attractions in Pigeon Forge! Dollywood, and Dollywood Splash Country! If you don't want to drive, the Pigeon Forge Trolley comes right by to take you anywhere you want to go. After a day out "on the town" come back, relax on a screen porch, jump into a jacuzzi, or just kick back on your private balcony and enjoy the "finer" things in life at Golfview! 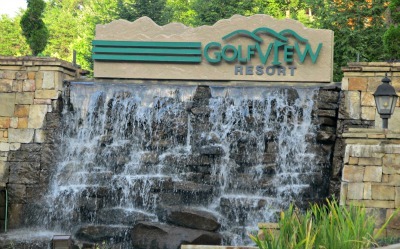 Golfview is located in Pigeon Forge on the Gatlinburg Country Club's Golf Course! DOLLYWOOD DREAMMORE RESORT - Dolly Parton's dream come true! This fabulous resort is the perfect setting for your dream vacation in the Great Smoky Mountains. It's the place to enjoy time with family, splash and play in gigantic swimming pools, and take in breathtaking views! It's a taste of country living, complete with rocking chairs! WILDERNESS AT THE SMOKIES - This "amusement park" and family adventure center is also one of the most popular Smoky Mountain Resorts! Everybody loves Wilderness At The Smokies! Mainly because it's home to Tennessee's largest indoor water park! The roof is transparent making it an excellent place to get a tan year around! There's also a huge water park outdoors, with some of the most exciting slides around! Wilderness at the Smokies recently added Adventure Forest! This cool recreation area features a 3 story ropes course, black light mini-golf, laser tag, and a huge arcade! If you love golf, you'll love the convenience of the Sevierville Golf Course right next door! Wilderness at the Smokies is conveniently located to everything Sevierville has to offer, and just a short drive away from Pigeon Forge, Gatlinburg, and the Great Smoky Mountains. WYNDHAM IN THE SMOKIES is a Smoky Mountain Resort that has a lot going for it! Of course you're familiar with Wyndham: the name associated with some of the finest, and most luxurious resorts in the world! Well, they have "outdone" themselves here too! Sure you're surrounded by the Great Smoky Mountains National Park! But Wyndham is also adjacent to Wilderness at the Smokies, which is near the Sevierville Golf Course, which is surrounded by other great attractions in Sevierville! There is no parking available for recreational vehicles, trailers, or boats on the property. Smoky Mountain guests do not have access to Great Smokies Lodge amenities and activities. THE RESORT AT GOVERNOR'S CROSSING - You can't go wrong here! The Resort at Governor's Crossing is a popular Smoky Mountain Resort in Sevierville filled with entertainment, shopping, and attractions. It's only minutes away from Pigeon Forge, and Gatlinburg. Dollywood, and the Great Smoky Mountains National Park is just a short drive away! When you stay here, you don't have to go looking for fun! This hot vacation spot has its own water park! Indoor, and outdoor! Bring your swim suit and be prepared for water fun during every season. Live the "high" life by enjoying the latest amenities in your one, two , and three bedroom condo. Sleep in a comfortable king, or queen sized bed, complete with fully equipped kitchens, and baths. For a quick weekend getaway, family vacation, or business trip, this "hot spot" has it all for the perfect getaway! Smoky Mountain Resorts are the best! Vacation packages are always available, early reservations are accepted! As a matter of fact, it's a good idea to make your plans early! As I said, all these resorts are popular, and have a tendency to fill up fast most any time of the year! At any rate, you'll enjoy excellent accommodations for the time of your life in the Smokies when you stay at one of these fabulous Smoky Mountain Resorts!